The SGE team is continually developing innovative ideas for products and technologies that make a difference for our customers .SGE started solely as a syringe manufacturer, but now manufactures a vast array of products for chromatography and mass spectroscopy. SGE is an ISO accredited company. We are proud of the fact that all major instrument manufacturers in our field rely on and incorporate SGE manufactured components in their systems. As one of the leading analytical instrument manufacturers, YL Instruments has produced reliable and superior chromatographs for more than 20 years through constant research and development in Korea. 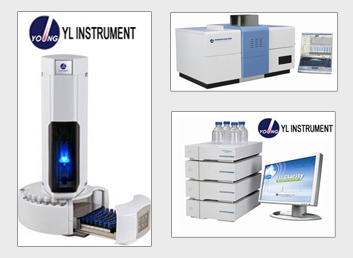 YL Instruments produces high-quality analytical instruments such as GC, HPLC, AAS and FT-IR with remarkable stability, outstanding reliability, and superior sensitivity. We also provide Chromatography Data System, Water Purification System, Gas Generators, and Concentration Evaporators for laboratory efficiency. World's large largest manufacturer of serial-production environmental simulation chambers for scientific or industrial laboratories. We specialize in the perfect simulation of biological, chemical and physical environmental conditions in the climate chamber or incubator. SUEZ Water Purifications Systems is one of the major European manufacturer of standard and custom built water purification systems for use in laboratory, healthcare and industrial applications. We are the technology leader for high precision thermoregulation in research and industry. Our products ensure precise temperature control in laboratories, pilot plants and production processes. The product range offers solutions for all thermoregulation tasks from -125 to +425°C. 20 years ago, we have started the ongoing conversion to eco-friendly refrigerants. Nowadays we offer a large part of our product range with environmentally friendly refrigerants as standard. Therefore we are a pioneer in the field of ecological and sustainable temperature control. 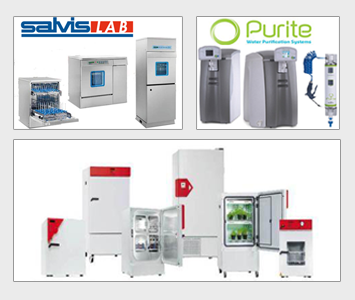 Suppliers of various equipments like autoclave ,anemometers , balances, baths, centrifuges, conductivity meters, density meters, dispensers, dissolved oxygen meters, evaporators, filtration apparatus, flame photometers, fume cupboards, furnaces, gas generators, gel documentation system, hot plates, hygrometers, ice machine, incubators, melting point apparatus, micro plate readers, microscopes, homogenizers, ovens, PH meters, pumps, refrigerators and freezers, safety equipments shakers, spectrophotometers, stirs, thermal cyclers, thermometers, timers, turbidity meters, ultrasonic bath, glassware washers and water stills and water testing equipment. Suppliers of various chemicals and reagents, laboratory glasswares and consumables. Biochrom has a long history of making quality scientific instruments for a wide range of applications in the clinical, life-science and industrial markets. Biochrom has committed to remaining a world class company by the regular introduction of new, innovative and customer focused products as well as by being open to external partnerships which present exciting new commercial or technical opportunities. Paragon Scientific Limited specialize in the production of premium quality reference materials that include Certified Reference Materials, Color, Density, Flash Point, Refractive Index, Total Acid Number (TAN), Total Base Number (TBN) and Viscosity Standards. Founded in 1994, we have developed an international reputation synonymous with quality, prompt delivery, affordability and first class customer service. A combination of advanced manufacturing techniques, the use of primary laboratory test equipment and methodology plus our acute attention to detail enables us to produce reference materials with some of the lowest levels of uncertainty of measurement available. Since 1958 Scavini & Co. manufacture petroleum testing apparatus. A well trained staff of electrical and mechanical engineers permits us to continuously update our products to the state-of-the-art technology and to the new requests coming from the market. Scavini starts its production: the catalogue listed more than 50 petroleum testing apparatus according to ASTM, IP etc. test methods, sampling cylinders and valves. In the early 70's Scavini manufactered its first automatic analyzers. Today, after 40 years since its foundation, Scavini is a dynamic enterprise capable to realize hi-tech equipment. Pharma Test develops, produces, installs and maintains instruments designed for the pharmaceutical industry since 1979. Today, Pharma Test supplies and supports a world wide market with hardware and software products which find application in the development, formulation and quality assurance departments for the production of tablets, capsules, suppositories, ampoules and various other solid dosage forms. Hitachi America, Ltd. is a leading manufacturer of industrial continuous inkjet printer products used for marking and coding in different packaging applications in the Americas marketplace. Our industrial continuous inkjet printers deliver state-of-the-art technology and advanced features to enable high-speed marking and coding operations. 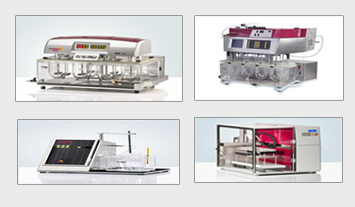 ANSER is a worldwide leading company in thermal inkjet technology (TIJ), providing the most cost-effective and maintenance free industrial inkjet printing solutions. For more than 27 years, we are dedicated to provide high quality equipments, supplies, and services designed to perform with maximum reliability, efficiency and ease of operation. EBS researches, develops and manufactures high-performance industrial Ink-Jet printers and consumables and is supplier of all of these high-quality Ink-Jet systems. Our printers and printing systems are successfully used in a wide variety of industrial and service applications where there is a need to mark moving objects, for example, on a production line. Solutions are also available for printing onto rotating or immovable objects based on moving print-head technology. Sauven's expertise is about ink jet coding and marking on cartons, trays, bottles, plastic bags, foil food packages, cans, extrusions and virtually any product. The software and hardware systems are used by several of the world's largest brand names in manufacturing & packaging to print best before dates, batch codes, 2D barcodes, graphic logos and many other coding and marking requirements.